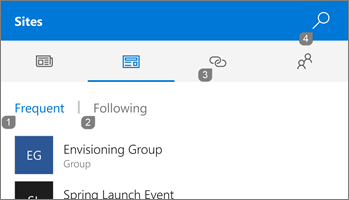 SharePoint for Windows 10 Mobile is a new way to get to SharePoint Online content. You can browse sites, team site activities, lists and people profiles. You can also search for people, sites and content and mark sites as favorites. SharePoint for Windows 10 Mobile is now available to everyone through the the Microsoft Store. If you downloaded a previous version, update it via the app store. When you launch the SharePoint app, you can sign in with a work or school account associated with your device or use another account with SharePoint Online in Office 365 (Enterprise, Education, Government and DvNext). SharePoint mobile apps are part of an overall modernization of SharePoint. See The Future of SharePoint event, the Your intranet in your pocket blog post and The Mobile and Intelligent Intranet: SharePoint sites and PowerApps Office Mechanics video for more details on SharePoint mobile updates. Tap a site under the word Frequent to get site activity and contents for team sites. The frequent sites list comes from Office Graph signals. Access sites you've followed by tapping Following under the Sites tab. You'll see the same sites as the Following section of SharePoint Home in the browser. Select from sites your organization has chosen on the Links tab. To get to more sites, tap the magnifying glass , enter some text and search. For more help, contact your IT department or administrator. If you're the SharePoint Online administrator, you can also open a support ticket in the Office 365 admin center. We love reading your suggestions on new features and feedback about how you use our products! Share your thoughts on the SharePoint UserVoice site. We’re listening.